Amazon's new Alexa lineup, including Gen 3 Echo Dot, speakerless Input, first subwoofer, and Link amp, could affect the smart-home installation channel and Sonos position in unexpected ways. New Amazon Echo products 9/20/18: Will the Echo Dot fit into existing 'architectural voice' products like Origin Acoustics' Valet? How will the new products compare with Sonos? Are they really calling these things 'Echo for audiophiles'? Amazon Echo is the world’s best-selling loudspeaker – not bad for a company that entered the category just four years ago, and consistently delivers mediocre sound. Now imagine if Amazon took its wildly successful smart speakers and actually did something about the "speaker" part. Audiophile quality from Amazon smart speakers? Doubtful. But at least, “some of the new Alexa-powered speakers could help Amazon catch up” to “much better listening companions” like Google Home Max, Sonos One and Apple HomePod, as Consumer Reports suggests. Here are some of Amazon’s latest audio announcements and how they could affect the smart-home installation channel. New Echo Dot Design – What Happens Now? As we discussed in the “Ultimate CEDIA 2018 Preview” webinar, many manufacturers over the past two years have built multiroom audio systems around the little Echo Dot – ignoring the built-in speakers and using the puck merely for voice control and streaming services. Origin Acoustics (Valet), Vanco (Spot for Dot), Pulse-Eight (Ducker), and Vanguard Dynamics (Vail Amp) are just a few of the channel-centric companies tapping the Dot for these purposes. "Unlike other systems out there, Origin Acoustics Valet is compatible with the ever changing form factor of the Echo ecosystem." So what’s to become of these form-fitting products when Amazon changes the specs for Dot? We’ll find out soon enough because the new Echo Dot 3rd Gen ($50) begins shipping Oct. 11. Amazon says Gen 3 features an “improved speaker for richer and louder sound.” Oh goodie. CE pros don't even want a speaker in the smart little streamer (hold that thought). Unfortunately, these so-called “improvements" add 0.6 inches to the Dot frame, and require a 15W power adapter instead of the original 9W USB. We hope these modest changes bring great joy to everyday consumers because they'll punish manufacturers and installers of today’s Dot-centric multiroom audio systems. Don’t despair, however, if you already spec’d or installed in-wall Dots for a multiroom audio system. First off, millions of Gen 2 products exist in the wild, and they’ll continue to get smarter like any other Alexa AI machine. Audio quality might degrade over time but who cares?! Right now Gen 2 Dots retail for $40 but you can find them for $30. The price will drop fast when Gen 3 arrives. Why not snap up a few dozen while you can? In any case, no respectable manufacturer in our channel would expect a high-tech product like Amazon Echo to stay static, either in form factor or feature set. Either they already accounted for Dot modifications in their initial designs, or they’re still in wait-and-see mode. Here’s what a few of the “architectural voice” vendors had to say about the Dot news. Dealers went nuts over Valet when Origin Acoustics launched this first-of-a-kind Dot-driven audio system at CEDIA 2017. The Dot goes inside a generic back box that installs just like Origin’s in-ceiling speaker brackets. The Amazon device sits in a cheap plastic insert – molded specifically for that Dot product – that holds it tightly in the speaker bracket. A standard speaker grille provides a clean finish. The back box was designed to hold a variety of small devices, from smart speakers to wireless access points, so the new Dot form factor doesn’t faze Origin. The company will simply make new inserts. As for the Dot’s new power specs, Origin just needs to modify the Cat 5 break-out box (power in, audio out) that feeds the Dot. "Getting into this type of product, we knew there would be constant changes. We are working on a modular add-on that would support the new devices." Vanco joined the Dot party just this year, introducing Spot for Dot at CEDIA Expo earlier this month. Vanco’s approach to Dot-driven multiroom audio differs from Origin’s. Instead of powering speakers through a centralized multizone amp, Vanco builds an amp into each Dot mount, which connects directly to local speakers. This distributed architecture means Vanco’s Dot-specific devices are fairly involved – requiring more than a new break-out dongle and plastic mounting ring for a next-gen Dot. Even so, Vanco is resting easy. Pulse-Eight, a popular UK-based manufacturer of multiroom A/V solutions, presented its Dot-driven Audio Ducker system as a concept earlier this year at ISE 2018. As with Origin’s Valet, the Ducker system starts with a centralized audio hub, which connects to remote Echo Dots via Cat 5 cable for streaming services and voice control. Pulse-Eight principal Martin Ellis says he’ll go back to the drawing board based on Amazon’s latest announcements. It wasn’t the Gen 3 Dot that disrupted the company’s plans, however. Rather, it was Amazon’s other new-product introductions that got Ellis thinking about better approaches to Alexa-driven multiroom audio. Speaking of re-evaluating its go-to-market plans, Pulse-Eight recently shifted U.S. distribution to RTI, which will phase out some of its own white-labeled A/V distribution products in favor of this reputable U.K. manufacturer’s. Pulse-Eight previously sold its products in the U.S. through Structured Cable Products (SCP). 'Architectural Voice': Origin Acoustics' Valet, with multizone amp in central location; Vanco's Spot for Dot and Vanguard Dynamic's Vail Amp, with amps built in. All this Gen 3 Dot nonsense could be for naught when it comes to the custom channel. That’s because Amazon announced the very product that should have been used all along for Dot-based multiroom audio systems: Echo Input. Basically, it’s an Echo Dot without the speaker. You get the same voice interface, cloud intelligence and streaming media as Dot … minus the added bulk, expense, heat, and complexity of a speaker you didn’t want in the first place. At $35 MSRP, Echo Input is pretty darn cheap – maybe not as cheap as a full-featured Gen 2 Dot, but worth the “premium” for a less intrusive, more purpose-built device for a whole-house audio system. Featuring a four-mic array, the Input connects to a speaker via Bluetooth or a 3.5mm audio cable. The company expects other speaker manufacturers to bundle the little puck with their own products, starting with Bose, the first partner announced. Amazon Echo Dot 2nd Gen, Echo Dot 3rd Gen, Echo Input with no speaker (images not to scale). Now comes the Echo Sub, a compact Home Pod-looking device that packs 100 watts with a 6-inch down-firing woofer. It's Amazon's first subwoofer. 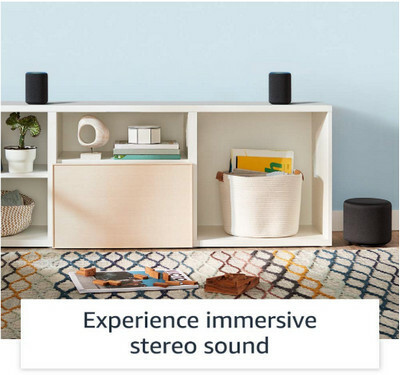 The company doesn't even sell one in its AmazonBasics line, although it does offer a soundbar with a "built-in" subwoofer. While the the new Echo Sub won’t be worthy of most custom projects, it will make sense for kitchens, garages, kids’ rooms and other spaces typically served by Amazon Echos. Pair two Amazon Echos with a new Echo Sub to get "immersive stereo sound." The subwoofer works only with Amazon Echo or Echo Plus 2nd-generation products. Users can pair two of the same Echo devices with a single subwoofer for “rich left/right stereo sound,” the company says. The subwoofer is now available for preorder ($130) and is expected to ship on Oct. 11. Amazon is bundling a Sub with two Echos for $250, or two Echo Pluses for $330. Should integrators care about the Sub? Maybe a little, but not because you can expect to make money from it. On the contrary, you should care because Amazon dares to improve Echo’s audio quality, which had always been reliably deficient. 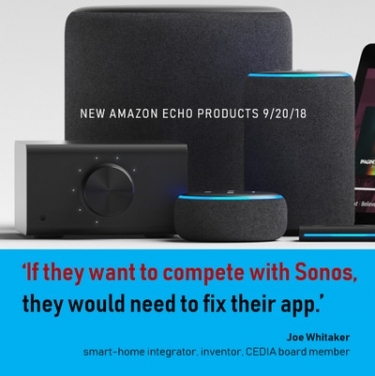 If the sonically improved speakers make you go, “Hey, that’s not bad!” then Amazon could capture market share from Sonos and other mid-market providers who support the channel. The new Echo products won’t have to sound great to succeed (Don’t we know it!). They just have to fall somewhere between respectable and pleasant. The allure of the Alexa platform, along with Amazon’s highly competitive pricing will make up for any sonic shortfalls. Amazon Takes on Sonos Amp? Echo has always been a voice assistant first, and a speaker second. The latest announcements, however, show Amazon is getting serious about sound. We saw hints of Amazon’s audio aspirations last year, when the company introduced Echo Plus, the smartest of its smart speakers. Amazon later added an equalizer feature to the product. We can now imagine a half-decent audio experience with two Echo Plus speakers and a new Echo Sub -- a combo that produces "immersive stereo sound," as Amazon calls it. Echo Plus launched about the same time as the new Sonos One, the first Sonos speaker with native Alexa. Amazon set a retail price of $150 for its new speaker, undercutting Sonos One by $50. Now Amazon is going after Sonos again, announcing the new Echo Link and Echo Link Amp – roughly equivalent to the old Sonos Connect pre-amp and Sonos Connect: Amp, but a whole lot cheaper. 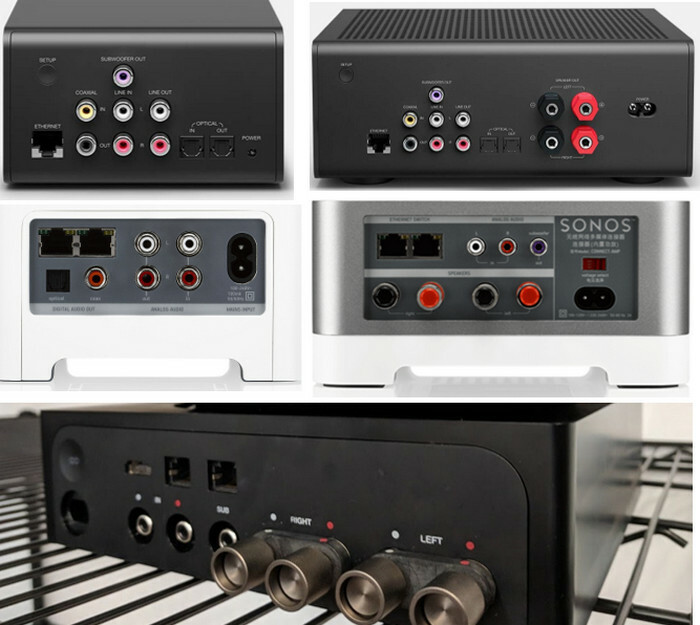 The Echo Link products feature similar input/output arrays as their Sonos counterparts, and Amazon wisely made the products black for a better rack-mount look. The Echo Link Amp has a 60W x 2-channel amplifier (Sonos Connect: Amp is 55W x 2), five lines out (analog, optical, coax, headphone 3.5mm, subwoofer) and three lines in (analog, optical, coax) to connect other audio components, plus left/right speaker binding posts to wire directly to passive speakers. It has a volume knob for granular control, an Ethernet port for hardwired connectivity, and of course full Echo multiroom music support. Circling back to the discussion on “architectural voice” above, Pulse-Eight’s Ellis raises a few good points about Amazon’s new products. In the case of his Ducker and similar Dot-driven multiroom audio products, the manufacturers must devise their own audio-interruption mechanisms to mute the speakers or lower the volume when the wake-up word (“Alexa”) is called. Great, so the Echo Links have all the right specs and low, low prices to go up against Sonos. Who knows, however, what the product will bring in terms of audio quality. Amazon seems to say little about that particular aspect of the lineup, although the omission doesn’t seem to deter the optimists. Others suggest Amazon won’t deliver quite the “audiophile” experience Sonos delivers – as if that’s the high-performance audio standard – but they note that Link products (like Echo) are cheaper than their Sonos equivalents for those who don’t need the most super-awesome fidelity. Echo Link (available later this year) will retail for $200; Link Amp (available early 2019) will sell for $300. Those prices compare to Sonos’s Connect ($350) and legacy Connect:Amp ($500). The brand new Sonos Amp (125W x 2 plus HDMI ARC) retails for $600. In all their talk about price and audio performance, however, these pundits miss one big thing in their Amazon adulation: user experience.